Graduated from George Air Field, IL. S/N: O-796356. He was a B-17 pilot serving with the 301st Bomb Grp 419th Bomb Sqdn flying missions in the Mediterranean Theater. John Fradel was his instructor. He graduated George Field, IL. S/N: O-795474. He was flying a B-25 (S/N: 41-30185) serving with the 345th Bomb Grp 499th Bomb Sqdn when his plane had a malfunction or was hit over New Guinea. The plane rolled over and crashed, killing all 6 crew members on board on March 19, 1944 (MACR #6734). John Fradel was his Instructor. He graduated from George Field, IL. S/N: O-795516. He was a B-25 co-pilot training with the 334th Bomb Grp 470th Bomb Sqdn flying in the South Carolina Area of the USA and was Killed In a Flying Accident on June 23, 1943 near Nesmith, SC. Warney Crosby was his instructor at Douglas. He had Basic at Greenville and Advanced at George Field, IL. S/N: O-796751. He was with the 5th A.F. flying B-25’s during WWII. He had a 33 year career in the Air Force. Click here for a bio (PDF). He graduated from George Field, IL. S/N: O-796752. John Fradol was his instructor. He graduated from George Field, IL. S/N: O-796753. He graduated from George Field, IL. S/N: O-796757. He was in the 6th A.F. in England flying over France and Germany. Afterward he attended Law School. He practiced law for 2 years. Next he started a cotton cleaning and processing factory in Memphis, TN. He became a well known and respected millionaire, giving a great deal to the Christian Athletes. He died at 54 years of age, on May 10, 1977. While at Douglas, he had a landing accident (ground loop), in PT-17, 41-25335.He graduated – S/N: O-795881. He was a transport plane pilot serving with the Air Transport Command based at Jorhat, India flying supply missions over the southern Himalayas into China. He graduated from George Field, IL, S/N: O-796759. He was a B-24 pilot serving with the 451st BG, 725th BS, flying missions from the Mediterranean Theater. On October 13, 1944, he was pilot of B-24J (S/N: 42-51764 with a crew of 10 on a mission to Vienna, Austria. Upon reaching the target, his plane was hit by flak and 2 engines burst into flame. He and some of the crew were able to bail out before the plane exploded (MACR #9047). He became a Prisoner Of War in Luft-Stalag 1. He graduated from George Field, IL. S/N: O-796762. He was a Squadron Leader. He was in the 487th Bomb Group. 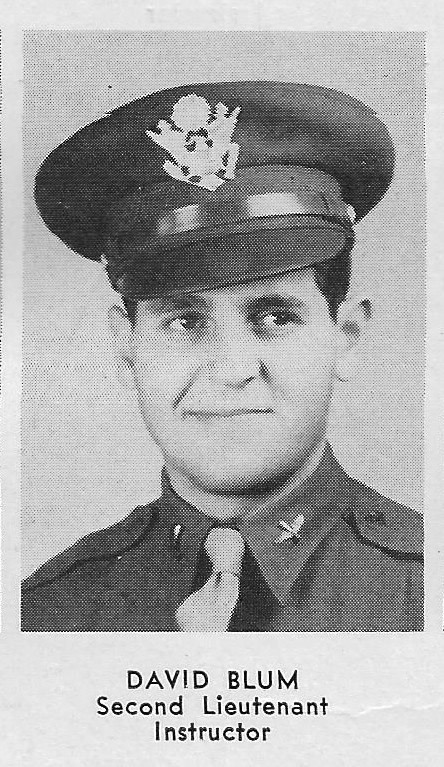 He was a co-pilot on a B-17 and was shot down by flak while over Hof, Germany on April 8, 1945 (MACR #13742). He is buried with his crew at the Jefferson Barracks, in St. Louis, MO. Delayed to 43B. May have washed out, possibly was a Navigator-Observer. He was delayed to Class 43B in Basic at Greenville. He graduated from Napier. He served on an Air Rescue Squadron, 65th Fighter Wing located at Boxted, England flying P-47s. 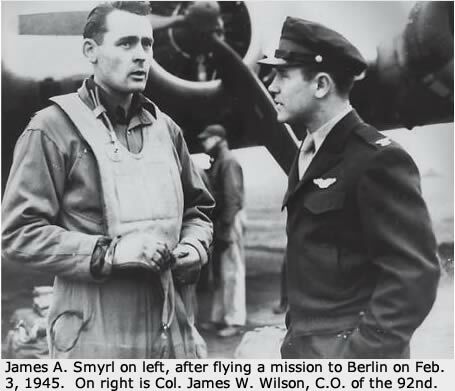 He is personally credited with saving 29 airmen’s lives. He retired as a Lt. Col. in 1966. Click here to read his bio (PDF). He graduated from George Field, IL. S/N: O-796764. He was sent to fly the “Hump”. He was killed just 9 days after getting there. He received the Purple Heart. He was a bombardier instructor based at Victorville Army Air Field in California (click here for a picture of him as instructor. He graduated with the Class of 43-02 at Victorville. S/N: O-795893 was attending Instructor training at Maxwell Field and was killed in a mid-air collision accident while piloting a BT-13A on February 5, 1943. He was a pilot with the North Atlantic Wing of the ATC and MATS in the late 1940’s, at one time seen at Westover AFB, MA, and then he served in the Korean War. Leo Bernard Braun, Graduated from George Field, IL. S/N: O-796771. He was with the 38th Bomb Gp, 823 Bomb Sqdn. He was the pilot of a B-25-D (S/N: 42-67286) and in a crew of 6 with the intended destination of Uligan Harbor, New Guinea in the S.W. Pacific on Jan. 8, 1944. The plane was hit by anti-aircraft fire during a run on the target. The right engine burst into flame, enveloping the entire plane in flames within 15 minutes. The plane crashed in an area occupied by the Japanese and was found in May 1946 as a complete wreck and widely scattered. There were no survivors. He graduated as a navigator/bombardier with the Class of 43-02 at Roswell, New Mexico on 01/28/43, S/N: O-728629. He was a B-17 navigator/bombardier serving with the 91st Bomb Grp 322nd Bomb Sqdn flying missions in the European Theater. On June 21, 1944 he was navigator in a B-17 (S/N: 43-37626) in a mission to Berlin, Germany when it was hit by enemy fire in the left wing; it caught fire. He and some other members of the crew bailed out, and he became a Prisoner Of War in Luft-Stalag 1 on June 21, 1944. He was injured with a right foot fracture and hurt fingers (MACR #5979). He graduated as a bombardier with the Class of 43-01 from Victorville Army Air Field, California on January 7, 1943, S/N: O-735857. He was a B-24 bombardier serving with the 44th Bomb Grp 66th Bomb Sqdn flying missions in the European Theater and was Killed In Action on March 27, 1944. A navigator who graduated with the Class of 43-04 from Selman Army Air Field, Louisiana on March 20, 1943. He graduated from George Field, IL. SN: O-796782. He was a B-24 pilot serving with the 389th Bomb Grp 566th Bomb Sqdn flying missions in the European Theater. On June 6, 1944 in the Normandy Invasion, he was pilot of a B-24 (S/N: 44-40247) when it crashed in England (initial cause unknown). He and the other 9 crew members were Killed In Action (MACR #7020). He graduated from George Field, IL. S/N: O-796783. He was with the 5th Fighter Command, 475th Fighter Group, 431st Fighter Sqdn. On June 30, 1944, he flew a P-38 J-10 (S/N: 42-67793) on a glide bomb mission on Noemfoor Island, Dutch New Guinea, S. Pacific and was lost. Click here to read more. of Woonsocket, S.D. in 1942. Graduated George Field, IL. S/N: O-796785. He was based at Tonopah Army Air Field in Nevada in 1945. He had Basic at Greenville, MS. Graduated from George Field, IL. S/N: O-796789. He was a B-25 pilot serving with the 321st Bomb Grp 446th Bomb Sqdn flying missions from the Mediterranean Theater. He graduated from George Field, IL. S/N: O-796790. He was with the 12th A.F., 321st (M) Bomber Group, 447th (M) Bomb Sqdn. On Feb. 19, 1944, he was flying a B-25C (S/N: 41-29775) from Vincenze Airdrome, Italy to Gaudo Airdrome, in southern Italy, in a Ferrying mission. He was last seen in heavy clouds making a diving left turn. The plane went missing. The cause of disappearance or crash is not known. Served in Africa, Sicily and Italy. Of Harrisburg, PA. Son of Harvey D Demay and Ida A Demay. Buried Plot: E, 103-104, Zachary Taylor National Cemetery, Nicholasville, Kentucky. He graduated from George Field, IL. S/N: O-796791. He was a B-25 pilot serving with the 42nd Bomb Grp 70th Bomb Sqdn “The Crusaders” flying missions in the Southern Pacific. http://harrydole.com/42nd/Chapter%2018/ . Afterward he was in the Insurance Business. He died in Feb. 1976. S/N: O-739410 was a B-17 bombardier serving with the 100th Bomb Grp 351st Bomb Sqdn flying missions in the European Theater. 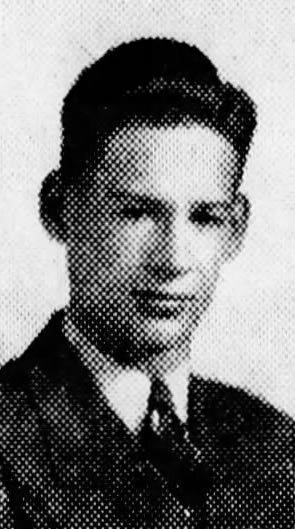 He graduated with the Class of 43-04 from Kirtland Field, New Mexico on March 11, 1943. He graduated from a navigator school in the Class of 43-07 at Selman Field located near Monroe, LA on May 22, 1943, S/N: O-803119. He retired from the USAF in August 1965. Charles Porter was his Instructor at Douglas. He had Basic at Greenville and graduated from George Field, IL. 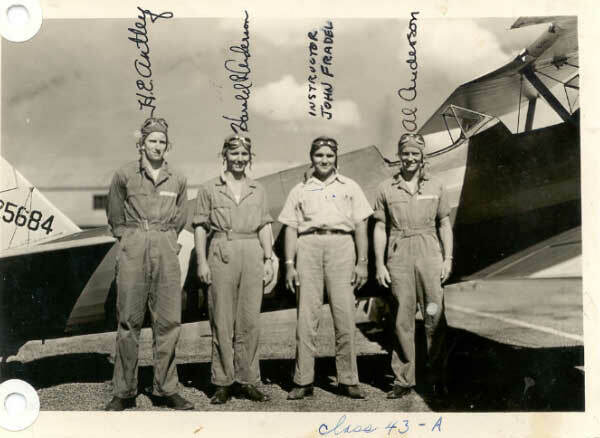 He was an instructor pilot at Cochran Field Basic Flying School in May 1943. Later became a Pilot for Pan American Airlines. He had Basic at Greenville, Miss. and graduated from George Field, IL. and went into B-24’s. He served in the 8th Air Force, 392nd Bomb Group in England for 25 missions. He returned to Langley Field in Va to do radar training. He was discharged as a Capt. in Dec. 1945. Then worked in a V.A. office for 5 years. He graduated from George Field, IL. S/N: O-796798. He served in Europe during WWII. He also flew in the Berlin Air Lift. He completed his career in the Air Force in Great Falls. He retired as a Major USAF on January 11, 1962. He graduated from the navigator school at Selman Field in the Class of 43-03 on February 27, 1943, S/N: O-798773. He was B-24 navigator serving with the 98th Bomb Grp 345th BS. On September 3, 1943 he was navigator in a B-24 in a mission on the railroad yards in Sulmona, Italy. The plane took a direct hit and he bailed out (MACR #464). He became a POW in Luft Stalag 1. He graduated from the bombardier school at Kirtland Field in the Class of 43-04 on March 11, 1943, S/N: O-739417. He served with the 95th Bomb Grp 412th BS. On April 29, 1944, he was a B-17G (S/N: 42-31320) bombardier on a mission to Berlin. His plane was hit by flak and he bailed out (MACR #4469). He became a POW in Luft Stalag 3. Graduated from George Field, IL. S/N: O-796800. He was a B-25 pilot serving with the 345th Bomb Grp 499th BS. On March 26, 1944 he was pilot of a B-25D that was on a local transition flight in the South-West Pacific Area and failed to return to base as expected. He went Missing In Action and was later declared dead (MACR #4496). Graduated from George Field, IL. S/N: O-796802. Graduated from George Field, IL. S/N: O-796803. He was an instructor pilot at Freeman Field Advanced Flying School (Two-Engine) near Seymour, IN in May 1944. He became a navigator, S/N: O-798776. He was in 98th Bomb Gp. On Feb. 25, 1944 he was on a mission to Regensburg, Germany in a B-24J (S/N: 42-100266). After dropping the bombs, his plane was hit by flak. The crew bailed out and he became a P.O.W. at Stalag Luft 1 Barth. He was a B-24 pilot with the 450th Bomb Group of the 15th Air Force in Italy. He flew 25 combat missions including the air raids on the oil refineries at Ploesti, Romania. At the end of the war he was an intelligence officer at the 15th Air Force headquarters. Born Feb. 9, 1920 in Springfield, IL. Graduated from George Field, IL. S/N: O-796804. S/N: O-795929. He was a P-47 pilot serving with the 355th FG 358th FS flying his missions from England into the European Theater. Basic at Greenville, Graduated from George Field, IL. S/N: O-796807. He was a transport pilot serving with the Air Transport Command based at Jorhat, India and was flying supplies over the “Low Hump” — the Southern end of the Himalayan Mountains and into China. Served after the War in Korea and Vietnam. See Find-A-Grave. S/N: O-795932. He was a P-47 pilot based at Dover Army Air Field near Dover, Delaware in December 1944 and most likely a test pilot with the Air Technical Service Command in its experimental projects office. In 1944 the Air Technical Service Command chose Dover as a site to engineer, develop, and conduct classified air-launched rocket tests. The information collected during these experiments resulted in the effective deployment of air-to-surface rockets in both the European and Pacific combat theaters. He had Basic at Greenville and graduated from George Field, IL. S/N: O-796809. He was assigned to Ft. Myers, FL. flying AT-6’s with gunnery students. He was also checked out in B-24’s and B-29’s. His crew was assembled, but the war was over and he did not go overseas. He returned to be a veterinarian for a couple of years. Then he was in sales management positions in Birmingham, Atlanta and Houston, TX. of Ft. Dodge, Iowa in 1942. He died while in Houston about 1987. He was in the 10th A.F., 33rd Fighter Group, 58th Fighter Sqdn. He was killed flying a P-47D (S/N: 42-25383) on a mission at Male, Burma on Nov. 15, 1944. His plane was hit by Lt. Billy T. Davis’ plane, and both planes crashed. Graduated George Field, IL. S/N: O-796611. He was the pilot of a B-24D (S/N: 42-40630) assigned to the ATC base at Jorhat, India, and on February 5, 1944 he and his crew were forced to bail out of this plane near Fort Hertz in Burma and safely walked to the fort (MACR #02314). He also served in Korea (See Find-A-Grave for pix). He was a corporate pilot for a Steel Co. He fought in the Philippines with the Army Air Forces. S/N: O-795589. He was in the 12th A.F., 57th Fighter Group, 65th Fighter sqdrn. Categorized as “DNB” (Did not die in battle). He was killed bailing out from a captured German fighter (a Messerschmitt Bf 109, more commonly called Me-109) at Amendola, Italy. Buried Fort Snelling National Cem. He was a navigator who graduated with the Class of 43-03 at Selman Field located near Monroe, LA on February 27, 1943, S/N: O-798805?. S/N: O-796829. He was a B-26 pilot serving with the 391st Bomb Grp 573rd Bomb Sqdn flying his missions over the European Theater. He graduated from George Field, IL. S/N: O-796830. Was in the 431st Fighter Sqdn, 475th Fighter Group. Was killed Jan. 21, 1944 while a passenger in a B-25G (S/N: 42-64807) flying from Durand Field, Port Moresby, New Guinea to Dobodura, New Guinea on an administrative flight. There were reports of hearing a twin engine plane and an explosion, but even after a very extensive search, no wreckage was found. He graduated from George Field, IL. S/N: O-796831. He had 5 years of active service including flying over the “Hump”. Then a career in the reserve. He graduated from Marianne AAFd with the class of 43A, S/N: O-795973. He was a C-46 pilot serving with the Air Transport Command based at Chabua, India and was flying supplies over the Southern end of the Himalayan Mountains and into China. He was MIA on September 1, 1944. The wreckage of the plane was found 16-1/2 miles SE of Tinkawk Sakan (MACR #07985). Wayne North was his instructor at Douglas. He graduated from George Field, IL. S/N: O-796835. He flew in North Africa, the C.B.I. over the “Hump” and the Berlin Airlift, for a 22 1/2 year career, retiring in 1963. He graduated from the flying school at Marianne AAFd, FL. S/N: O-795974. He was a P-47 fighter pilot serving with the 355th FG 358th FS flying missions in Europe. On April 15, 1944 he was flying a P-51D (S/N: 43-6925) when it was hit by flak on a mission over Wittstock field, Germany. He became a POW (MACR #4068). He is credited with two aerial victories. He graduated from George Field, IL. S/N: O-796838. He was a B-24 bomber pilot serving with the 93rd Bomb Grp 328th Bomb Sqdn flying missions from England. His plane made a crash landing during a mission to Brunswick, Germany, and he and his crew became interned in Switzerland on January 30, 1944 (MACR #2341). His plane was named “Sunday Girl”. He served in the So. Pacific with the 13th A.F. He returned to be a farmer. He also operated an airport and was in the field tilling business. He graduated from the officers’ candidate school at Miami Beach AAB, FL. with the Class of 43C on April 16, 1943, S/N: O-578270. He was trained to do administrative duties.He apparently served as the Civil Defense Training Officer for Massachusetts in the 1950’s. He was in the 9th AF, 389 Bomb Group, 566 Bomb Sqdn. On Aug. 1, 1943, he was co-pilot on a B24-D (S/N: 42-40115 “The Boomerang”) leaving from Benghazi with a target of Campina, Rumania (Ploesti Oil Fields). Upon returning from the Ploesti raids, at 80 SSW of Campina, the ship caught fire from a blaze that started after an explosion (MACR #159). 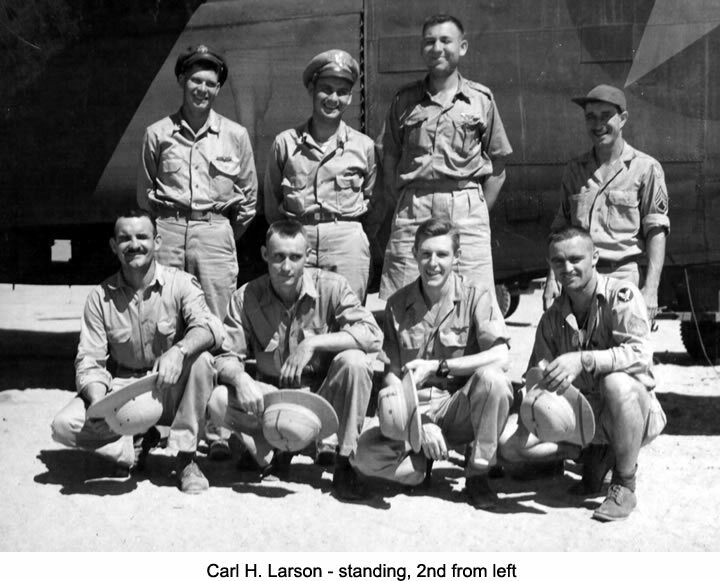 The entire crew survived, with most of the crew, including Larson, becoming POWs. 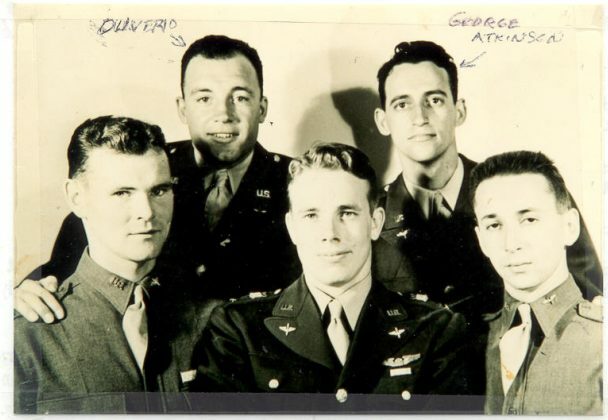 Click here to see a picture of him and the crew of his B-24 that went down in the Ploesti raid. 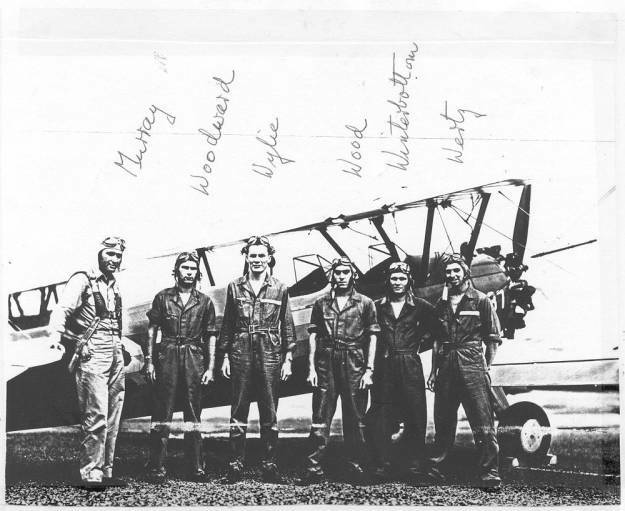 He graduated from the flying school at George Field, IL, S/N; O-796845. He was a B-26 bomber pilot serving with the 391st Bomb Grp 572nd Bomb Sqdn flying missions in Europe. See http://www.391stbombgroup.com/572crew.htm. He received the Air Medal. He graduated from George Field, S/N: O-796646. He was a B-24 bomber pilot serving with the 489th Bomb Grp 847th Bomb Sqdn flying missions from England with the Eighth Air Force. Graduated from George Field, S/N: O-796650. He was a B-17 bomber pilot serving with the 390th Bomb Grp 570th Bomb Sqdn flying missions from England with the Eighth Air Force. His B-17 was named “Cash & Carry” and was shot down near Munster, Germany on October 10, 1943, and he became a POW (MACR #860). Cadle was his instructor at Douglas. He had Basic at Greenville arid graduated from Blytheville AA Field, Ark. in class of 43B. He was with the 98th Bomb Group in Benghazi, Libya flying B-24’s and flew in the Ploesti “Low Level” mission on 8/1/1943. He flew a total of 33 missions in Sicily, Italy, Crete, Cypress and Yugoslavia. Then instructed in B-24’s and B-29’s in the U.S.
Click here for his bio (as a PDF). S/N: O-800390. He was with the 388th Bomb Group, 563rd Sqdrn. On Jan. 29, 1944, he was a co-pilot flying a B-17 (S/N: 42-3285) on his 15th mission with the target of Frankfurt, Germany. They had just left the target when they were hit. All members parachuted, but two broke their legs on landing (MACR #2349). He was a P.O.W. in Stalag Luft #1, Barth, Germany. He was trained in B-17’s at Sebring, FL. He served in the 92nd Bomb Group, 8th A.F. in England. He flew 25 missions. As a civilian he has been a Civil Engineer. Mildred was a Flight Nurse during the War. He graduated from George Army Air Corps Field, Lawrence County, IL. S/N: O-796876. He was a B-25 bomber pilot serving with the 42nd Bomb Grp 69th Bomb Sqdn flying missions in the South Pacific and became MIA on October 10, 1943 and was never recovered (#786). Sponsler was his instructor at Douglas. He graduated from George Army Air Corps Field, Lawrence County, IL. S/N: O-796878. He then instructed at Blytheville AA Field, Ark. in AT-6, AT-9 and AT-10’s. Then he was in A.T.C. flying Air Rescue in Canada and Alaska for the rest of WWII. He also served in Vietnam. He was a A-36 fighter-bomber pilot serving with the 86th FG 526th FS flying missions in the Mediterranean Theater. Distinguished Flying Cross. Went to Basic at Greenville and George Army Air Corps Field, IL. for Advanced, S/N: O-796884. He was assigned to Bombers and Anti-Sub Patrol in the South American area. Then he had further training in Florida, Iowa and Utah. Next it was England. He was a B-24 bomber pilot serving with the 467th Bomb Grp 791st Bomb Sqdn flying missions from England with the Eighth Air Force and was KIA on April 22, 1944 while returning from a mission. Click here to read a newspaper article about him (a PDF). S/N: O-796894. He was a B-26 bomber pilot serving with the 322nd Bomb Grp 449th Bomb Sqdn and was flying to England under ATC control to serve with the Eighth Air Force and was Killed in a Flying Accident (KIFA) near Saint David’s Head, Wales on June 4, 1943. Charles Sherrill was his Instructor. He had Basic at Greenville, Advanced at Craig Field. Then went to N. Africa flying Spitfires. Then on to Italy. He flew 155 missions and was credited with 3 Me 109’s destroyed. After the war he flew for Pan American Airlines from 1945 and retired from them in 1978. Click here to read his bio and see him with his Spitfire (a PDF). Born July 11, 1918, Springfield, Mass. Of Boonton, N.J. and Surf City, N.J. He graduated from George Army Air Corps Field, Lawrence County, IL. S/N: O-796897. He graduated from George Field, S/N: O-796898. He flew B-17’s with the 8th A.F. (England) 92nd Bomb Group and was commanding officer of the 327th Bomb Sqdn. He was recalled for the Berlin Air Lift. He stayed in the Service and made a full career of it. Emmett was his instructor at Douglas. After Emmett’s death Robert was assigned another instructor. He graduated from George Army Air Corps Field, Lawrence County, IL. S/N: O-796899. He served in the USA as an instructor. He flew AT-6, AT-9, & AT-10’s Also B-26’s and B-29’s. Charles Sherrill was his instructor at Douglas. He graduated from George Army Air Corps Field, Lawrence County, IL. S/N: O-796908. He was a B-26 bomber pilot serving with the 386th Bomb Grp 555th Bomb Sqdn flying missions from England with the Ninth Air Force and was KIA on March 16, 1944. It is believed he was killed in a mid-air collision on an approach to a landing. Charles Sherrill was his instructor at Douglas. He had graduated with the Class of 42-17 in Selman Field on December 12, 1943, S/N: O-795313. He was a B-24 bomber navigator serving with the 98th Bomb Grp 344th Bomb Sqdn flying missions in the Mediterranean Theater with the Ninth Air Force and went Missing In Action / killed in action during the famous August 1, 1943 raid on Ploesti, Romania. He graduated from the flying school at Marianne AAFd, FL, S/N: O-796049. He was a P-47 fighter-bomber pilot serving with the 356th FG 361st FS flying missions from England with the Ninth Air Force and went MIA on February 21, 1944. The Germans reported that he had been shot down (MACR #2674). Roy Windsom was his instructor at Douglas. He graduated from George Army Air Corps Field, Lawrence County, IL. S/N: O-796919. He served in the S. Pacific, including New Guinea. Click here for his military career (a PDF). Roy Windom was his instructor at Douglas. He graduated from George Army Air Corps Field, Lawrence County, IL. S/N: O-796921. He became a B-25 pilot. He had a serious mid-air collision in Australia and was the only survivor, with many injuries. However he was back flying in about 2 years. Afterward he became a “Human Engineer,” in other words a Doctor. Buddy Hasell & Wendell Holmes were his instructors at Douglas. Later he was with the 86th Fighter/Bomber Group in the African/Mediterranean theatre flying A-36’s . He retired as a Colonel after 30 years. Click here for his bio (PDF). Click here for his interesting impressions of Douglas as a newly-arriving cadet (PDF). He died on Mar. 26, 1991. He had Basic at Greenville, Ms. He was a F-10 Mitchell recon pilot serving with the 69th PRG 101st PRS flying training missions in the USA and was killed in flying accident near Alexandria, Louisiana on July 31, 1944. Graduated from George Army Air Corps Field, Lawrence County, IL. S/N: O-796923.He was a B-26 bomber pilot serving with the 391st Bomb Grp 575th Bomb Sqdn flying missions in Europe. Graduated from George Field, IL, S/N: O-796924. He became a B-25 instructor. 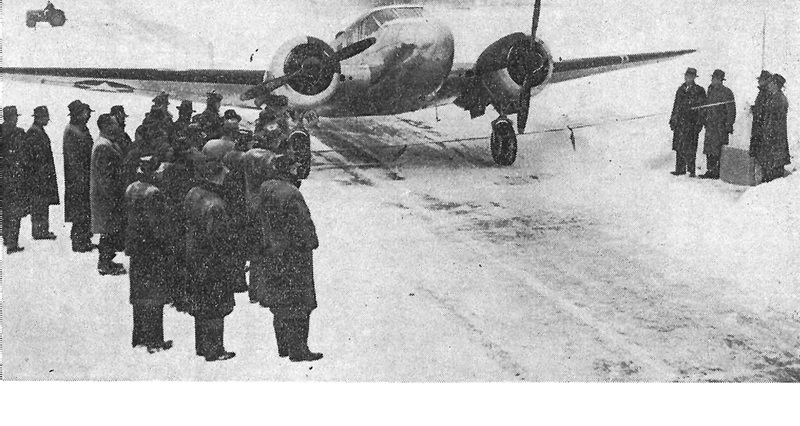 In 1945 he was pilot of a C-45 used to cut the ribbon of the new Westchester County Airport. See the newspaper picture here and the article here. He returned to New York and the textile business. Ray Murray was his instructor. He completed Primary. He graduated Jan. 13, 1943 from George Army Air Corps Field, Lawrence County, IL. S/N: O-796925. He went to B-24 transition school and then to north Africa. He flew several missions but his plane was badly damaged by fighters as he flew back to base. With two engines out on the same side, he made a forced landing in the desert with severe damage to the plane and many injuries to the crew. He was hospitalized for about a year and retired with a medical disability. He was never quite the same after that and died May, 1969 at 51 years old. He was best man at the wedding of Morris Quick, who supplied his service info. Death date was obtained through web search. Enlisted 27 Jan 1942. Released 26 Dec 1946. He had Basic at Greenville, Miss, and Advanced at George Field, IL. He flew with A.T.C. which included flying the “Hump”. He also served in the Korean War. Then after the war He was a Pilot for National Airlines. He was in Basic at Greenville, Miss, when he had a mid air collision with Lt. J. H. Williams (Student Officer at Douglas 42K.). It was at night in the pattern. Both were killed. Buried in Highland Cemetery, Norwood, MA. He graduated from George Field, IL, S/N: O-796930. He was a B-25 pilot assigned to the 38th Bomb Grp 823rd Bomb Sqdn called “The Sunsetters” flying missions in the South-West Pacific Area. Later became a doctor per Find-a-Grave. Ray Murray was his Douglas instructor, and his was Ray’s 1st class. George graduated from George Field, IL. S/N: O-796933. He served in the United States flying B-26’s but suffered with a back problem and stopped flying. S/N: O-796053. He was a P-47 pilot assigned to the 355th FG 358th FS flying missions in the European Theater, when on December 11, 1943 he was killed in a flying accident at Steeple Morden in England. Ray Murray was his instructor. Ray Murray was his instructor. He completed Primary. He was a pilot in the 127th Liaison Squadron based Statesboro AAFd in Georgia and was killed in a landing accident in a Piper L-4A on January 23, 1944. He graduated from George Field, IL. S/N: O-795492. He was a B-25D co-pilot assigned to the 309th Bomb Grp 426th Bomb Sqdn flying training missions in the USA, when on March 24, 1943 he was killed in a flying accident while enroute from Columbia, SC to Savannah, GA.